It will only exacerbate the causes of terrorist attacks, diminish society’s capacity to cope rationally with risks, and permanently damage freedom, democracy, and international law. 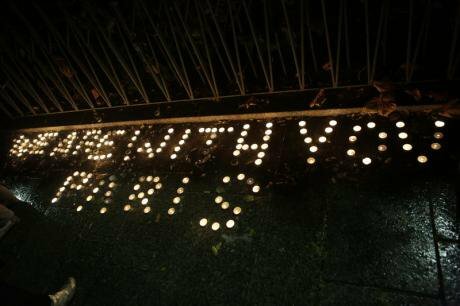 Written in candles opposite the Bataclan, November 16, 2015. Demotix/ Michael Debets. All rights reserved.For more than a decade, European societies have criticized and resisted the American approach to terrorism. France, once one of the most vocal critics of George W. Bush’s ‘war on terror’, is now opting for the same discredited, costly, and counterproductive model of pursuing homeland security. It will only exacerbate the causes of terrorist attacks, diminish society’s capacity to cope rationally with risks, and permanently damage freedom, democracy, and international law. 9/11 – a lesson unlearned? In its name, extraordinary unconstitutional measures, both domestic and international, were adopted. Vast and limitless surveillance and personal data collection schemes were created. After the second terrorist attack in Paris this year, France has declared a state of emergency and recently prolonged it for another three months. The state of emergency grants authorities vast powers to limit civil liberties in the name of combating terrorism, spy on its own citizens, conduct random and warrantless raids and searches, place people believed to be a threat to public order under house arrest, control the press and other media outlets, close public meetings and spaces and cancel peaceful marches. Having classified the Paris attacks as an act of war, France also launched massive retaliatory airstrikes on ISIS for which there is no legal basis in international law. France’s response to terrorist attacks now seems to strictly follow the American counterterrorist playbook. Wasting no time to assess the nature of the unprecedented risk represented by the 9/11 terrorist attacks, former US President George W. Bush framed the terrorist attack as an enemy’s act of war and declared “global war on terrorism.” In its name, extraordinary unconstitutional measures, both domestic and international, were adopted. Vast and limitless surveillance and personal data collection schemes were created, limits on arrests and detentions were removed. The US launched illegal wars, established military tribunals and indefinite detentions for “enemy combatants” in secret prisons, used torture as an interrogation technique, and extradited terrorist suspects, thus violating their human rights and laws of war. The magnitude of human, social, political, economic, and other costs of the US response to 9/11 is now immeasurable. The wars in Iraq and Afghanistan have cost thousands of American lives and produced tens of thousands of injured and traumatized veterans. Estimated economic costs of both wars reach trillions of dollars. Billions of dollars were spent on homeland security. Hundreds of thousands of civilians were killed abroad and millions displaced. The injustice and excesses of the ‘war on terror’ contributed to the emergence of new radical Islamic organizations and have boosted people’s motivation to engage in violence, both at home and abroad. The injustice and excesses of the ‘war on terror’ contributed to the emergence of new radical Islamic organizations and have boosted people’s motivation to engage in violence, both at home and abroad. Counterterrorism campaigning has also led to what could possibly become a permanent damage to American society. The American Psychological Association’s report Collateral Damage shows that a decade of anti-terror policies have turned America into a fearful, anxious, and irrational society unable to react to risks rationally. It has created conditions conducive to hate crimes, discrimination, and prejudice. Countless constitutional scholars have pointed out that counterterrorism policies have significantly undermined privacy rights, strengthened the executive power, weakened the judicial process and procedures of democratic legitimation and public accountability, made it normal to divorce administrative discretion from public control, and weakened international law. The adoption of the war construct by Bush’s administration resulted from an attempt to do justice to the novelty of the 9/11 terrorist attacks. Until the beginning of the twenty first century, terrorism in western countries took the form of an illegal, violent tactic (hostage taking, kidnapping, assassination, explosions) employed by a domestic organized group (FLQ, ETA, IRA, RAF) aimed at the state and in pursuit of a clear political goal – independence, separation, liberation, or protest against corrupt business and political elites. The 9/11 attacks were interpreted as committed by a foreign actor but within state borders, with a set of goals and with a potential to use weapons of mass destruction. Adherence to a conventional political notion of an enemy and the assumption that the enemy can be destroyed by capturing its members and destroying its infrastructure underlay the design of counterterrorism policy. That there is no victory in the war against terrorism, because the enemy is significantly more amorphous, became obvious very soon. That there is no victory in the war against terrorism, because the enemy is significantly more amorphous, became obvious very soon. In 2004, bombs made of nails and dynamite were detonated in commuter trains in Madrid by a group of Islamists from north Africa and Spanish criminals who were inspired by a tract on an al-Qaeda affiliated website. A year after, British-born suicide bombers with backpack peroxide bombs blew themselves up in the London underground. Both attacks were committed by loosely organized cells of self-proclaimed, autonomously acting jihadists with vague goals and with no direct involvement of al-Qaeda. All terrorist attacks in the west since then, both successful and prevented, have been cases of so called homegrown terrorism – terrorism committed by individuals either born and raised in the west or living in the west during their formative years, and acting with varying degrees of autonomy, sometimes completely on their own behalf, without military training and without taking direct orders or getting any support from an organized militant group abroad. The perpetrators have been “self-recruited” and “self-radicalized” using radical Islam and jihadist ideology, which they absorb mostly through peer pressure and the internet. The gunmen who killed at Charlie Hebdo were two orphaned brothers born in France to Algerian immigrants who obviously turned to militant jihadism out of a deep sense of neglect, alienation, and the life-long experience of discrimination against minorities. Their path to terrorism led through street gang membership and prison where they encountered other self-radicalizing youths and preachers of radical Islam. The attackers of Paris were mostly EU nationals linked to an autonomous Brussels-based terror cell with a history of thwarted attacks. They had pledged allegiance to ISIS and some spent time in Syria. ISIS –whose dramatic rise certainly has a lot to do with US counterterrorism foreign policy – now seems to be aiming at inspiring sympathizers to conduct attacks in the west and perhaps coordinating them. However, we must see the Paris attacks in the context of an ongoing series of more autonomous acts, like the Boston marathon explosion or San Bernardino shooting. We need to grasp perpetrators’ psychological traits, combine them with feelings of loss of significance, alienation, social exclusion, the impossibility of succeeding and integrating into society, together with a sense of stigma and discrimination — to see how they facilitate the path to self-destructive violence and the cold-blooded, meticulously planned acts of mass murder of random civilians. And we also need to understand the role of ideology in this process and how exactly the “deadly ideological pathogen” transmits and contaminates a susceptible person. Homegrown terrorism is a civilizational risk of twenty first century society. Homegrown terrorism is a civilizational risk of twenty first century society. It needs to be seen in the context of other modern risks such as gun violence, other types of mass shootings, drug and disease epidemics, natural disasters, transportation accidents and infrastructure failures. These risks are an ineliminable fixture of contemporary society. Homegrown terrorism, like the other risks, can never be fully contained and prevented. Many perpetrators of recent terrorist attacks were known to intelligence agencies. While we certainly should investigate into failures of our security systems, we also need to acknowledge that it is impossible and enormously costly to track every single move of thousands of potential suspects. Most security experts warn that even with much closer surveillance, there will be attacks smaller or bigger, carried out on a short notice by a handful of operatives and with simple technology. If we want to minimize risk of homegrown terrorism, we need to have a correct understanding of its origins, causes, and its nature. The “enemy” is not a clearly detectable, organized, and institutionalized group with simple political goals which can be easily eliminated by military or police means, but a very complex social problem requiring novel approaches focused on how an individual perpetrator emerges from the interplay of specific social and psychological conditions and ideological manipulation of any kind. Any measures we have adopted so far are based on a misconception of what current terrorism is and are stunningly ineffective and counterproductive. Any measures we have adopted so far are based on a mis-conception of what current terrorism is and are stunningly ineffective and counter-productive. The most genuine approach to managing risks is to rebuild resilience. As American scholar Stephen Flynn suggested, resilience can derive from national character but it can also be reinvented through a clear and simple policy program consisting in building robust infrastructure, strengthening human resourcefulness, and reinforcing the capacity of rapid recovery from a catastrophe. Bolstering society’s resilience is aimed, first and foremost, at minimizing consequences and bouncing back, not at an ineffective and costly preemption. It requires being aware of the threat, knowing about its probability and likely course and knowing what to do when it strikes. Today’s terrorism can only be minimized by complex social and economic reforms, not by unconstitutional and undemocratic emergency governance and rights derogations which are doomed to become permanent given the permanent possibility and fluidity of a risk such as homegrown Islamic terrorism. Unlike the USA, France has a very large Muslim population and has failed to deliver fully on its integration promise. It also has a political system with much more centralized power, a strong executive and strong state emphasizing secularism. The dangers of serious social and political damage and the exacerbation of the roots of problem following a misguided response are way too big.